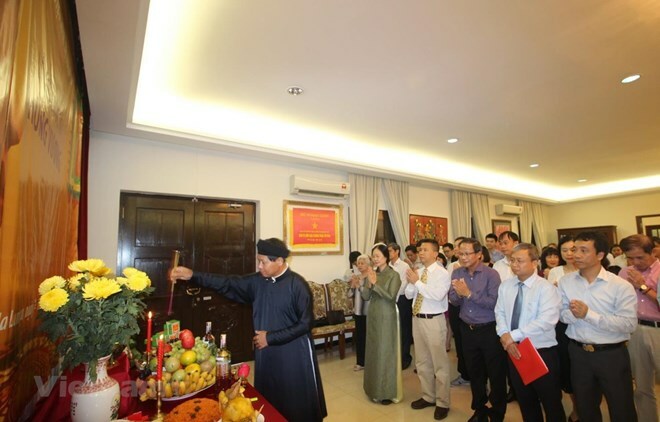 Kuala Lumpur (VNA) – The Vietnamese Embassy in Malaysia organised a get-together on April 12 to commemorate the death anniversary of the Hung Kings, the legendary founders of Vietnam. Vietnamese Ambassador Le Quy Quynh, the embassy’s staff, Vietnamese representative offices, and Vietnamese expatriates offered incense and flowers in tribute to the ancestors. Earlier, in talks with Vietnamese people, Quynh laid stress on the contributions of the Hung Kings to the country as founders of the early nation state, previously known as Van Lang, whose dynasty lasted between 2879 BC and 258 BC. The Hung Kings memorial day has been popular worldwide since the Hung Kings worshipping ritual was recognised as a UNESCO Intangible Cultural Heritage of Humanity in 2012, he said. Celebrations for the Hung Kings’ death anniversary have been held in Malaysia for many years, helping promote solidarity among Vietnamese expats and giving Malaysian people a deeper insight into the Hung Kings worshipping ritual.